Burnley forward Matej Vydra is hoping to strike up the same understanding with his new team-mates as the one he formed with Troy Deeney at Watford. The Czech Republic international had two successful stints at Vicarage Road in the Championship, winning the division’s Player of the Year award in 2012/13 as the Hornets reached the play-off final. The dynamic duo netted 39 goals between them that season, scoring in the same fixture on six occasions, including the dramatic play-off semi-final victory over Leicester City. Two seasons later, after the Udinese man spent a term on loan at the Hawthorns with West Bromwich Albion, the pair rekindled their partnership once again. This time they combined to score 37 goals between them, again scoring in the same game six times, as Watford were promoted to the Premier League as runners up. 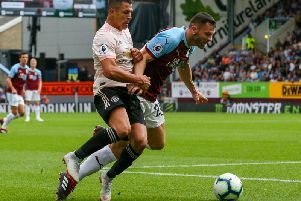 With the opportunity to play alongside the likes of record signing Chris Wood, Ashley Barnes and Sam Vokes at Turf Moor, he said: “If I score 10 goals in the Premier League it would be nice for me. Fingers crossed I can do it. “I think we have good strikers, especially for me, because we have Vokesy, Barnesy and Woody, they are strong and tall, they can win the headers for me and I will run around them. It’s a similar link to what I had with Troy Deeney a few years ago. “It’s big difference between the Championship and the Premier League. The 26-year-old, who was the star of the show at Derby County’s Player of the Year awards ceremony last season, has never really been given the opportunity to shine at this level. Vydra made just 24 appearances in the top flight across stints with the Hornets and the Baggies, scoring three times, but now he’s more determined than ever to prove himself. Ahead of Sunday’s game against Wolves at Molineux – where he scored in a 2-2 draw for Watford in March 2015, he said: “I was fighting for the Premier League for the last four years. “It’s hard to be in the Premier League. I’m there now but it’s even harder to stay there. Now it’s up to me but also up to gaffer for him to give me the chance. “I’m excited to be here and I can’t wait for the next game. “For a Czech boy from a small city everyone is dreaming of the Premier League because it’s the best league in the world, with the best players.